Navy coach Ken Niumatalolo no longer gives his team a pep talk on the night before a game. He ceded that responsibility to his record-breaking quarterback Keenan Reynolds last season. The 5' 11", 205-pound senior doesn't speak up often, but when he does, his teammates listen quietly and intently. "What he says carries a lot more weight than I do," Niumatalolo tells The Inside Read. "I can guarantee you that." It's also because of Reynolds' legendarily meticulous work ethic both on and off the field. Reynolds visited Navy practices before he was even enrolled at the academy to better learn the program's vaunted triple-option offense. But his focus wasn't only on football. Soon after he arrived at Annapolis, he figured out how to spend extra time with his professors to make sure he kept up with academics in classes with topics like global threats. And he would track his progress during grueling military physical training tests by asking for split times. His all-around approach to academy life bodes well for the quarterback when his full-time military career begins after graduation next spring. His future could be in cyber warfare or as a pilot; he will find out his career path during the academy's Service Assignment Day on Nov. 19. But first, Reynolds is trying to keep the Midshipmen (5–1, 3–0) in the hunt for the AAC championship this season, their first in the league after more than a century as an independent. With the vastly underrated Niumatalolo leading the way, Navy hasn't missed a step during the transition to conference play. The Midshipmen are on the verge of reaching a bowl game for the seventh time in the coach's eight seasons in charge of the program. Reynolds has been a big part of Navy's continued success. He's rushed for 636 yards and 11 touchdowns on 125 carries this season, while completing 54.2% of his passes for 415 yards and two touchdowns. "There couldn't be a better role model for our young people in America," Niumatalolo says of Reynolds. "There's so many issues going on in our country, but there are still a lot of good kids. It's cool to have a person that's excelling in football, but is also a great person. For Americans to see him, a young man at the United States Naval Academy, all of us are paying for his scholarship because we're all taxpayers. The money's going to good use. He's not only been a heck of a football player, but he's going to be a phenomenal leader in the military. He already is." The undersized Reynolds was overlooked coming out of Goodpasture Christian School in Madison, Tenn., four years ago, but there were signs that he was going to be a remarkable player. Both the Midshipmen and Air Force went after him hard. Niumatalolo wasn't sure which program Reynolds would choose. During the last weekend before signing day in 2012, Reynolds called Niumatalolo and asked one question: "Will I have a chance to start as a freshman?" "Well, everybody's got to earn it," Niumatalolo recalls telling Reynolds. "We'd love for you to come and compete. I can promise you're going to have an opportunity to compete for the job." Reynolds thanked Niumatalolo for his time and hung up. Afterward, Niumatalolo briefly regretted his answer to Reynolds' question. "Crap, I blew that one," Niumatalolo recalls thinking. "I should have just told him, Yeah, you can come here and start." But Niumatalolo's answer hadn't dissuaded Reynolds, who had been starting ever since he began playing football. "All I wanted was a chance," Reynolds says. After Reynolds signed with Navy, his desire to start as a freshman was evident. During Goodpasture Christian's spring break, he made the trip to Annapolis to attend the Midshipmen's spring practices. "Not too many high school seniors that do that," Niumatalolo says. "They're going on vacation with their buddies or family, but he made sure to be there." And when Reynolds finally did enroll, he was even more diligent. When his fellow plebes were just trying to gut out finishing a timed military track test, he wanted to know his splits, according to Niumatalolo. A military instructor later told Niumatalolo that had never happened before. "He's so meticulous," Niumatalolo says of Reynolds. The quarterback also took the initiative to find out the location of his group study sessions, and how he could arrange for extra time with his professors. "Some of these guys are just scrambling to keep their head above water with football, military and academics," Niumatalolo says. "He had a meticulous, detailed, thought-out plan as to how he wanted to accomplish all that. Now as I look back, that's him on the football field." It didn't take long for Reynolds to make an impact. 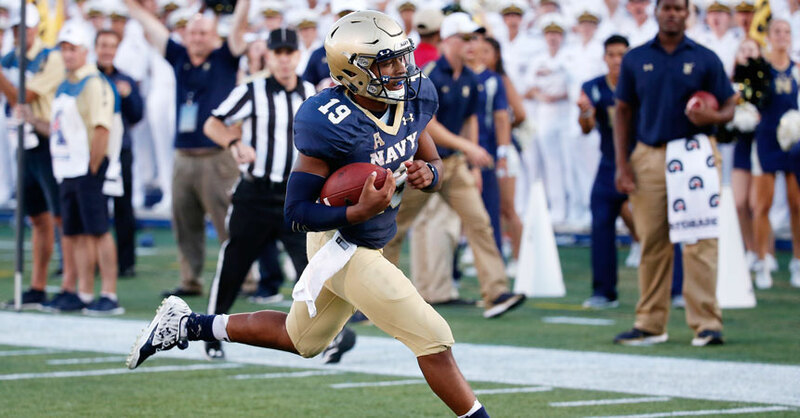 On the road against rival Air Force in the fifth game of his freshman year, he was forced into action when starter Trey Miller suffered an ankle injury midway through the fourth quarter, with Navy trailing 21–13. A couple plays in, Reynolds made a read on a play-action route and completed a pass to his safety-valve option, something the Midshipmen hadn't even done in practice. He led Navy on a 75-yard drive that ended with his first collegiate touchdown, a 15-yard run. 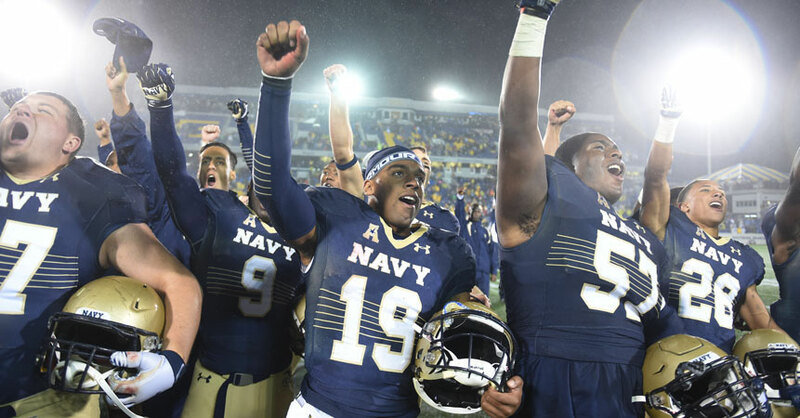 The Midshipmen went on to win 28–21 in overtime. "It just made you realize this kid was different and he was special," Niumatalolo says. Since then, Reynolds has been Navy's starting quarterback. In his first start, he had a career-high three touchdown passes in a 31–13 victory at Central Michigan. "The way he processes information in our triple-option has been unlike anybody we've had," Niumatalolo says. "He's been so, so good with it. He's an extension of [offensive coordinator Ivin Jasper] on the field, and knows exactly what we want to run and what people are trying to do to us. It at least gives us a chance because we have a guy out there making great decisions." After the victory over the Chippewas, Niumatalolo saw Reynolds's mother, Jacqueline, standing outside the locker room waiting for her son. She just smiled and said, "I told you so." During Keenan's recruitment, Jacqueline had questioned Niumatalolo extensively about whether her son would start. In one of those conversations, she had told Niumatalolo, "My baby's going to start." Niumatalolo did his best not to laugh or be rude back then, but four years later he laughs at himself recalling the story. "She was right," Niumatalolo says. "She was a lot smarter than I was. I should have listened." Niumatalolo takes great pride in Reynolds's pursuit of Ball's career touchdown record. "Think of all of the guys that have played college football over its nearly 150 years of existence," Niumatalolo says. "I don't know how to describe it. It's just mind-boggling that you've got a guy from the Naval Academy who's got a chance to have that record. Obviously, it's a monumental feat for him, his family, our program and his school. It's just hard to fathom though, because there's been so many great players, and to say he's No. 1 is pretty remarkable." Niumatalolo finds it especially so considering that Ball was a bruising running back. "It's not like Keenan is Tim Tebow," Niumatalolo says. Reynolds, however, is tired of the constant chatter about Ball's record. "It's huge, but honestly we've been talking about it for so much and so long that I'm just ready to break it so we can end the conversation and then I can continue to go about my business," Reynolds says. "It's pretty awesome, but I'm not going to get all caught up in it. I'm just going to move on, keep playing and keep doing my thing." For Reynolds, that means continuing his speeches the night before games. He usually stresses the Midshipmen's "1–0" motto, which loosely means trying to win every day, every practice and every repetition. Prior to Navy's season-opener in September, Reynolds also spoke to his teammates about how he prepares the night before games. Before the Midshipmen's lone loss, to Notre Dame, his talk focused on what inspires his teammates to do what they do. "I just try to be genuine and tell them how I feel," Reynolds says of his speeches. "The thing that resonates the most when you're talking to your teammates is for them to see the same person up in front of them that they see when it's just you guys, or when you guys are hanging out on the weekend, or in practice. If they can see that consistent focus, then they respect what you have to say a lot more." That's why Reynolds' isn't a rah-rah type like some of his teammates. It's just not who he is. "That's the key—just remaining true to who you are, not trying to deviate from your personality to make a point," Reynolds says. "A lot of times people get in leadership positions and they try to be someone they're not. It's very easy to see through that and you lose respect as a leader." Reynolds is anxious to apply his leadership to his full-time military career, either in information warfare, as a pilot or a Naval flight officer (the person in the backseat of a two-seater jet). "You have to be able to speak in front of your people, be able to motivate them and get them going," says Reynolds of being a Navy officer. Sounds like the Navy is going to be hearing plenty more speeches from Reynolds.